Ok, I'm coming clean. I have a love affair with Korean culture (both traditional and pop). - I love love love Korean food! Back in Manila, my SIL Lorr and I would go on food trips in authentic, hole in the wall Korean restos. - I love Korean food so much, I would eat soon du bu if not spicy Bon Chon chicken once a week when I was pregnant with Berry. Never mind that I'd throw it up later, haha. - K-Town is one of my favorite places in Manhattan. - Of course, here, I enjoy going to the Korean grocery H-Mart to stock up on beef short ribs and bulgogi cut beef, plus Korean no MSG instant noodles! Yum! 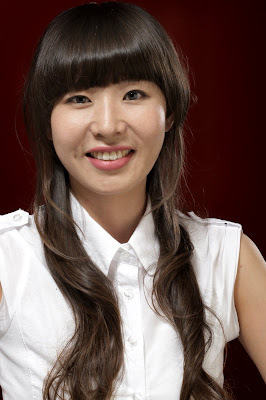 I mean, just looking at Creative Director Maiya Noh and Style Director Jinny Kim's hair styles, it doesn't take much convincing for one to see that this is the place to go for authentic Korean cuts! 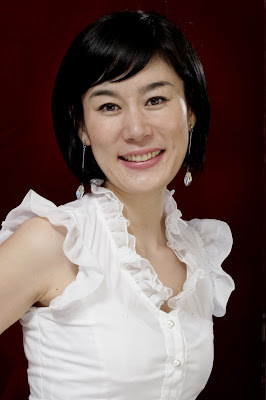 According to Maiya, for 2009 “Women’s hair trends will play to the extreme...We will see more of the bob, bangs and fringe hairstyles in different lengths and volume.” Although for those who want the gorgeous Korean movie star curls, Filipino stylist Al Ong can do the perming for you! Services unique to Park Jun's Beauty Lab, according to Jinny Kim, is Volume Rebonding (Php 4,600 to Php 9,200), which not only straightens out the hair but gives it volume, and Volume Magic Wave (Php 7,800 to Php 11,200) that creates perfect and more natural looking curls. Since Leslie just got her hair cut and styled recently, she decided to get her hair colored at Park Jun's, and she was super pleased - with her new hair color and with the place & service as well! She said, "They're super okay because they advice you as to what is best for you, like in my case, my hair was colored before, so they explained that they have to color the bottom part (the part with hair color) first before the virgin hair since hair color is absorbed faster by virgin hair. They also advised me that it was better if i get the color treatment rather than the curl masque since my hair is not dry." "The place is very nice, with 2 private rooms (additional 10%) and a makeup room!" "As for the people, they're very friendly. They really make conversations and spend lots of time with you." I think Leslie might have labbed Park Jun's Beauty Lab so much, she left the place looking like a real Korean girl! Heehee! Park Jun’s Beauty Lab is located at the G/F Glorietta 3, Ayala Center Makati City. 819-3001 to 02. 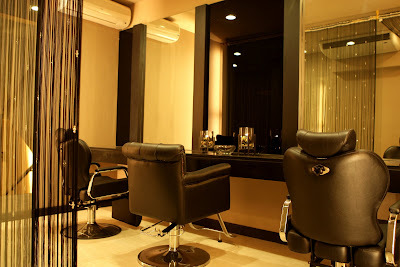 Hair cuts range from Php 600 to Php 1,200 for ladies, and Php 450 to Php 1,050 for men. To know more about Park Jun's Beauty Lab visit www.parkjun.com. Is H Mart an international chain? There's one in Vancouver too. I'm always stopping by to buy aloe vera drinks, salmon sashimi, and roast seaweed. I would say that Park Jun is way above Tony & Jackey. do-not-like-T&J! heey. :) i recently stayed at the shangri-la hotel in manila which is just a short walk to park jun's beauty lab. whenever i visit the philippines, i always get my hair cut and colored at the same salon, but i'm ready for a change. since you already listed the price for a haircut, did your friend also happen to tell you how much it costs to get your hair colored as well? Hi This is KAye Cepeda From studio 23's lifestyle program US GIRLS. Its the show hosted by chesca Garcia, Iya Villania, Angel Aquino, with Meagan Young. We're having an episode about "The Virtual Life" we wish to invite you sana for interview for one of our segments. The shoot will be on Tuesday sana at ABSCBN. Thanks so much. you may contact me at 09153990172. Thanks so much. I had my hair permed at Park Jun's and it ended up more damaged. I went to their salon last October to have my hair permed but they said that my hair is too damaged that I need to have my hair treated. So I availed of their promo - the Mucota Treatment which cost me almost 20K for six sessions. I noticed that my hair became healthier so I even bought their Home treatment. After the sixth session last November 30, they said the next time I go back, I can have my hair permed already. Last December 8, I went back to Park Jun's and asked if they can already have it permed (as I always do). The senior stylist checked my hair and gave it a GO so I was happy. They said I need to have it treated AND permed that day so I agreed. So they did all the rituals... and after 6 hours of waiting, my hair is ready for rinsing... The assistant talked to me and told me that the perm did not really had an effect because my hair is too dry... So I need to have it treated and I need to do the maintenance which involves twisting my hair every now and then to have the "permed" effect. The senior stylist talked to me and said that my hair is too dry I need to have it cut -- Whaat? After all the money I spent to have my hair treated they will say the reason why the perm did not take effect is because my hair is "too dry?" After all the money I spent for the treatment, the recommendation is to have it CUT? I even asked them if I can have it permed... If they said NO, I wouldn't force it anyways... I was planning to go back to their salon to have my hair fixed again because in the first place it was their salon who treated my hair and then have it damaged because of the Perming process. I will check with them if they can have my hair treated for free (at least the 6 sessions I paid for to have my hair treated).